After being in a horrific car accident which caused fatal and life changing injuries to her travelling colleagues, she feels nothing but guilt and suffers recurring nightmares. Even though she knows deep down, that the crash wasn’t her fault. Anna believes that she needs to get away, so she applies for and is offered a job on the remote Scottish island of Rum. The “hotel” she joins is really a glorified guests house, and the only accommodation for visitors or indeed anyone who wants to stay overnight on the Island. Anna believes that the first intake of guests after she arrives are okay, some a little strange, but a good set of strangers nonetheless. But one of them knows exactly who Anna is and is determined that she should not be enjoying her life, when she was involved in the crash that ended the life of another. Sleep (or lack of) is the perfect title for this novel, because I guarantee that once you’ve picked it up you won’t be able to sleep until you’ve finished it. My favourite C.L. Taylor novel so far, and one of my favourites of 2019! 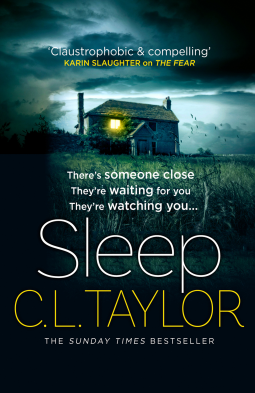 Sleep is available from 4 April 2019.